If you are planning a get together this summer and aren’t sure of everyone’s dietary needs it’s best to err on the side of caution. Having a gluten-free option on the table will ensure that guests with gluten allergies will have something to nibble while visiting. 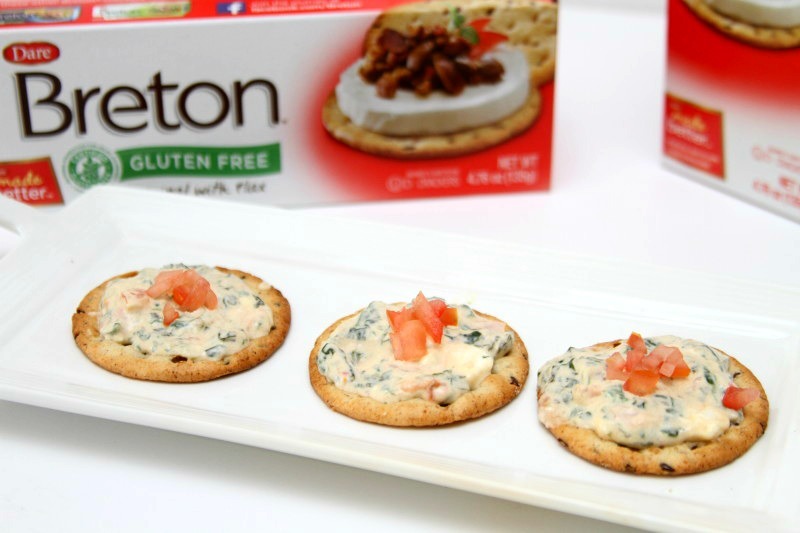 I make a simple spinach tomato dip and serve with Breton gluten-free crackers that is always a crowd favorite. These Breton crackers have a tender-crisp texture and are made with arrowroot flour and green lentil flour. The first time I tried them I couldn’t believe they were gluten-free. These are crackers that I keep stocked in my pantry because they are so very good and make a perfect snack, but it’s nice to have them on hand for my gluten-free friends as well. 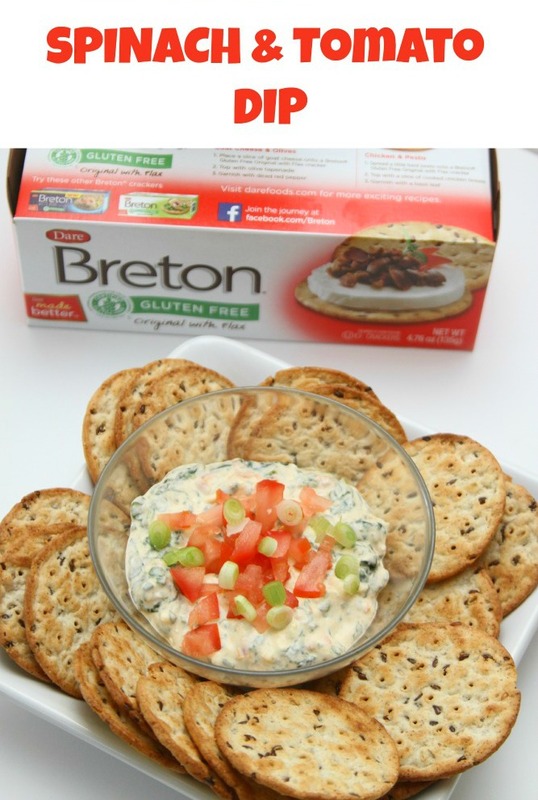 Breton also makes an Herb & Garlic cracker that I love and it’s also gluten-free. This spinach tomato dip is so easy to make. Simply gather together cream cheese, feta cheese, a fresh tomato, a bunch of spinach, 1 garlic clove and 2 green onions and you have everything needed for this dip. 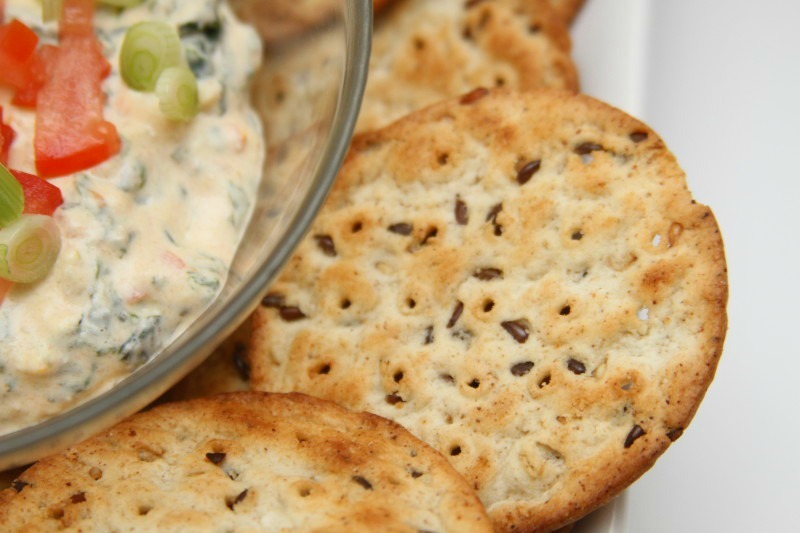 I pair this with the flax cracker because I think flax is a nice accompaniment to the vegetables in this dip. 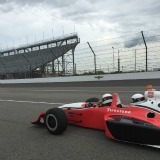 Ready for how easy this is? Step 1: Cut or break the stems off the spinach leaves and rinse leaves under water then dry. Next, dice the fresh tomato, finely chop the green onion and mince the garlic. Step 2: In a medium size skillet heat 1 teaspoon of extra virgin olive oil. Add spinach and garlic and cook until spinach is complete wilted. Mix in diced tomato and heat thoroughly. 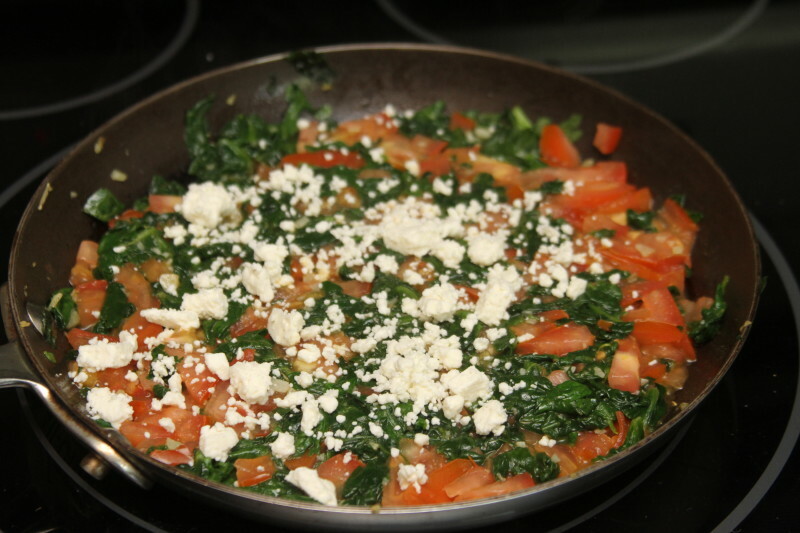 Sprinkle with 2 heaping tablespoons of feta cheese, continue cooking for 3 minutes. Step 3: Remove skillet from heat, pour contents into a medium size bowl and add 4 ounces of room temperature cream cheese. Mix to combine. 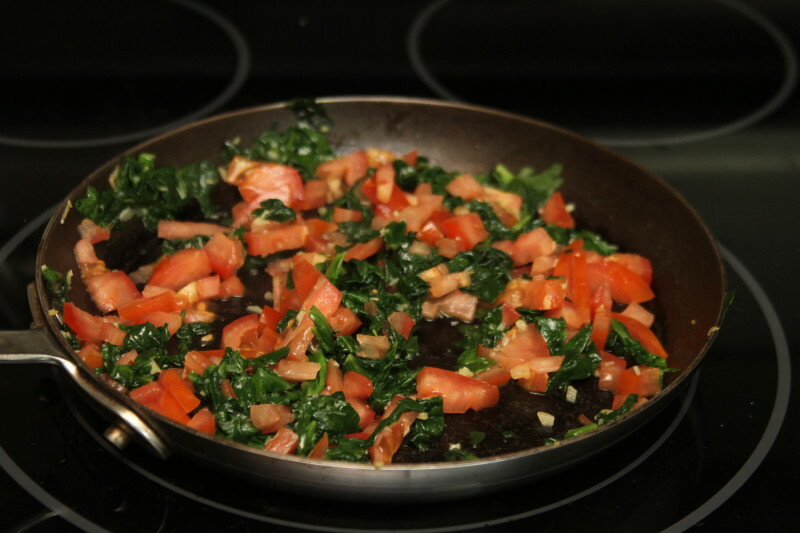 Garnish with diced tomato and finely chopped green onion. 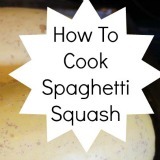 I am a big fan of adjusting recipes as I go and I would encourage you to do the same. If you don’t like garlic, skip it. Want more or less tomato? Mix in what makes you happiest. Want to skip the green onion and use red pepper instead, feel free. I’m sharing a base recipe and hope that you’ll play with it to make it your own. Then, when your guest come over you can wow them with your culinary skills. 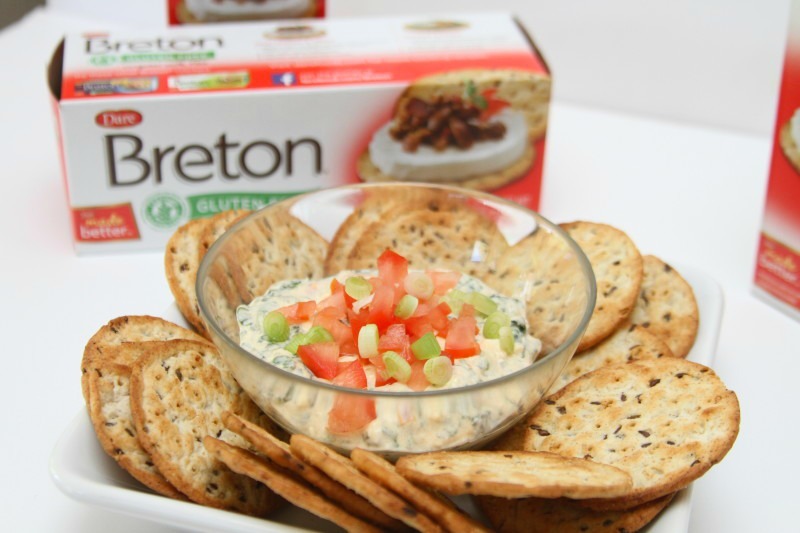 Step 4: Serve with Breton Gluten-Free Original with Flax crackers. Enjoy! 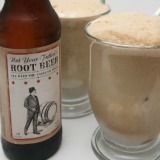 Note: Can be served hot or at room temperature. Pour 1 teaspoon of extra virgin olive oil in a medium skillet. Add spinach and garlic. 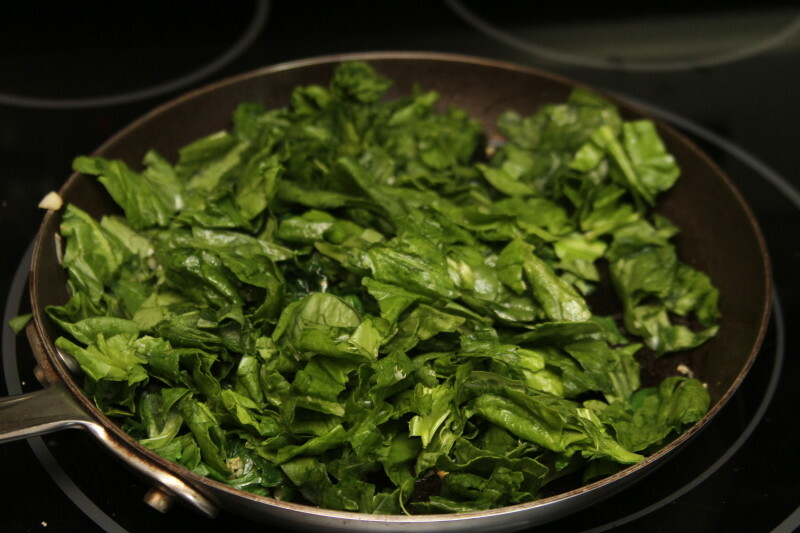 Over a medium high heat, cook until spinach is completely wilted. Add tomato and heat through, about 4 minutes. Add feta cheese and cook another 3 minutes. Remove from heat. Pour spinach mixture into a medium bowl. Add cream cheese and mix to combine. Garnish with any remaining tomato and green onion.